As online business continues to grow, more businesses are now looking for ways to utilize mobile devices for their daily operations. This has led to the creation of different mobile applications designed to help shoppers browse different websites on their mobile devices. The new idea of shopping from a mobile device comes with numerous benefits for both retailers and shoppers. On the side of retailers, it becomes extremely easy to reach out to potential customers. With an online store that can be accessed on a mobile device, a retailer is guaranteed to make a lot of sales. Shoppers, on the other hand, have a chance to search for products and place their orders using their mobile devices. This gives them a chance to shop for their preferred products and services at their own convenient time and place. Shoppers no longer have to waste time and money traveling from one street to the other in search of stores. They can now do their shopping from their mobile phones and other mobile devices. What a simple and convenient way to shop! But for your customers to be able to buy your products or services from their mobile gadgets, you have to design a special mobile website. This can prove to be quite taxing for beginners. But you do not need to panic as there are numerous ways in which you can make the work of designing a mobile website easy. For instance, you can consult a professional web designer for advice on how to go about the process. With a qualified web developer, you will understand the ins and outs of mobile web development. Furthermore, you can now find numerous web development tools online, most of which are offered for free. You no longer need to spend hefty sums of money purchasing web development tools. 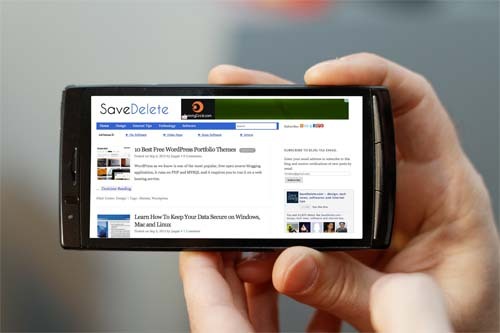 Here are several practical tips on how you can develop your own mobile website. When you are designing a mobile website, it is imperative to ensure that the mobile web design strategy you come up with is faultless. It will be a waste of time to keep redesigning your mobile website every so often. Your target customers may lose confidence in you. In today’s business, it is all about being consistent and unique. Try to give your target market a reason to trust in you. By doing so, you will always be ahead of your competitors. It is also imperative to bear in mind the fact that you are developing a website that will be viewed by billions of mobile users around the globe. You should always keep this fact at the back of your mind as you continue with your web development task. It means that you have to come up with a site that will attract international appeal. For this to happen, there are several things you need to do. Research on your target market: If you want your mobile website to attract more customers, it has to appeal to them. This means that you have to create something that everyone can relate to. That’s why you need to know the likes and dislikes of your target customers. Once you understand these aspects, it will be quite easy for you to develop a website that your customers can identify with. That’s the secret to becoming successful in this fast-paced business world. Come up with the best design: When you are designing your mobile website, it is wise to take some time to research on the most attractive web designs. Remember, the design you choose will either break or make your site. Thankfully, you can now find numerous web design ideas on the internet. Furthermore, they are available for free. Make sure that you pick a design that suits different tastes and preferences. How Responsive Is Your Mobile Web Design? Some market analysts predict that mobile web practice will soon surpass desktop usage. So, it is very critical that you create a site that will send the right message to your target customers. When you are picking your web design, it is important to ensure that it is fully responsive. This implies that the design should be compatible with different mobile platforms. Designing a responsive mobile website is important since mobile devices come in varied sizes, designs and patterns. Therefore, if you want your company’s site to be accessed by the largest number of target customers, it has to be compatible will all mobile devices. This is where the greatest hurdle lies. But you do not need to feel defeated because there are several web development tools that can help you design a responsive mobile website. Obviously, you will have to create content for your mobile website. It is your duty to ensure that your visitors can easily identify with the content. The content should be fresh, relevant and useful. If you do not have the necessary skills to develop content for your mobile website, consider hiring professionals to do it for you. When you are creating the content, consider things such as font size and color because the content will be displayed on a small screen. Make sure that it is reader-friendly. Also, keep your content precise and to the point. Nobody has enough time to peruse a lot of irrelevant content. Given the complex nature of mobile websites, it is good to define your list of options properly so that the viewer can easily find whatever they need on your site. The most important part of developing a mobile website is to ensure that it is functional. It means that your target customers must be able to perform different functions on the site without a hassle. You should never restrict functionality on your mobile website. It can easily chase your customers away. It is also important to make the site user-friendly. Users should find it easy to navigate through different pages of your site. Generally, the site should be attractive, simple, and user-friendly.